I’m not sure why but I don’t seem to have spent too much time cooking in the last few weeks, which explains the lull in posts here on the blog – and several restaurant reviews before that. Well I’m just about back and today I’m going to revisit a dish which I last prepared for Hana and I back in August. “But isn’t that just being lazy?” you ask. Well not really as I switched up the recipe a bit this time so it really is different enough to warrant another post. So what have I been cooking up? Cakes, brownies? Sorry it’s another veggie recipe. Veggie in that the sausages I use are vegetarian but could easily be switched for their meaty counterpart. Have I stopped eating meat you may ask as the last two main course recipes have been vegetarian or even the dreaded vegan! Don’t worry I’m still omnivorous and I’m sure there will be a suitably meaty post to sink your teeth into very soon. 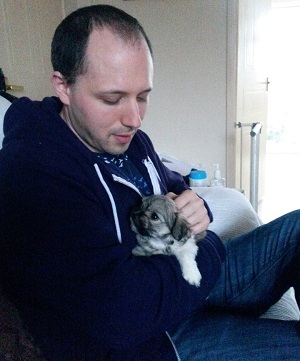 Aside from not doing too much in the kitchen I’ve also been getting ready for the forthcoming addition to our flat, little Zephyr the puppy who’ll be coming to us in January when he’s old enough. 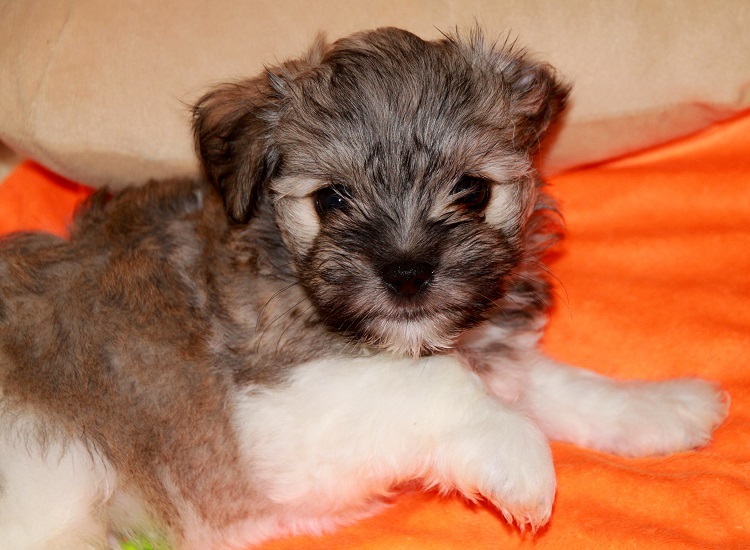 I had to include a picture of him so you can see just how adorable he is and also how small he is when we first met him. Check out him sitting on my lap, he’s so sweet! We’ve been busy getting little bits and pieces for when he arrives, like his crate chew toys and a snuggle sack. What’s a snuggle sack? I hear you ask. It is a cosy little fabric den which the dog can snuggle into and make his or her own. His little chew toys look so cute as even in adulthood little Zephyr will never be very big. I’ve also been a little awol from the kitchen as I’ve been preparing myself for becoming a dad to little Zephyr. Is it too indulgent to call yourself your dogs ‘dad’? Well I’ve been doing it anyway! One thing I have been doing is furiously reading books on techniques and ideas for how to raise a perfect puppy and turn him into a happy and contented adult dog. There’ll be lots more on Zephyr in the coming months I’m sure! So back to some cooking! I said I cooked this back in August and here’s the link to that recipe. I’ve switched it up a bit this time with a few new ingredients and omitted some from last time. 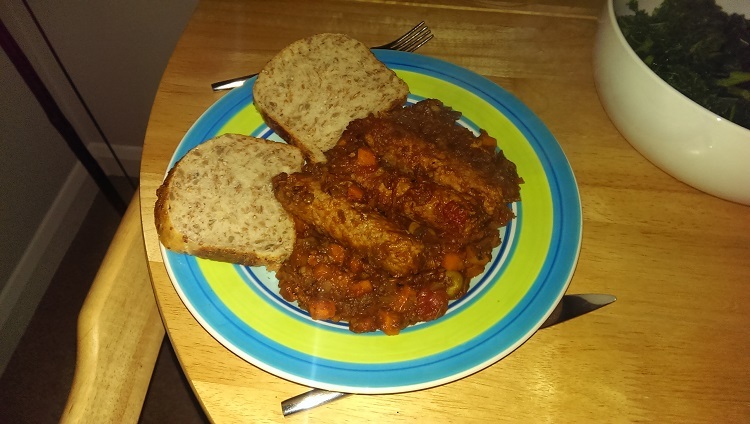 Again it is a really nice mid week meal which you can make for veggies and meat eaters alike. Start by dicing, chopping and preparing the vegetables as directed. Pop the oil in a heavy bottom iron pan and saute the onions, garlic and carrots for around 10 to 15 minutes or until the carrots are soft. 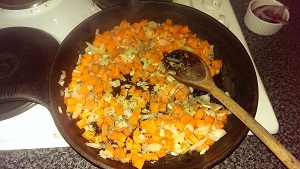 Once the carrots and onions are softened add the dried thyme and stir in. 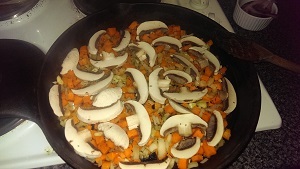 Then lay the mushrooms on top and cook for several more minutes till the mushrooms pick up a nice brown colour. Pop in the plum tomatoes and stir through thoroughly. At this point I like to add a little pinch of brown sugar to bring out the tomatoes natural sweetness. Bring to a boil then simmer. You’ll need to add some of the water but how much is down to how thick you want your sauce. Less water, thicker sauce. Lay the sausages in the sauce and simmer for around 5 minutes before adding the green lentils. Simmer for 20 minutes or till the lentils are thoroughly cooked through. Serve three sausages per person on a bed of the sauce along with some crusty bread and green vegetables.